The tension between hope and the realities of the world is a long-term interest for Candler School of Theology professor Ellen Ott Marshall. Two Picasso paintings -- one depicting the horrors of World War II and the other showing a child learning to walk -- aptly illustrate that tension, she said. And reflecting on such images can also be a practice of hope. “That exercise of moving back and forth between the two [paintings] has remained for me a helpful kind of grounding exercise, but it’s also a way to communicate to groups what I mean by moving between these two images,” said Marshall, an associate professor of Christian ethics and conflict transformation. In addition to her academic work, Marshall has worked with the refugee resettlement programs of Church World Service and the United Methodist Committee on Relief (UMCOR) and served as the lead writer for “God’s Renewed Creation” for the United Methodist Church Council of Bishops. She spoke with Faith & Leadership while teaching at the Summer Institute of the Center for Reconciliation at Duke Divinity School. The following is an edited transcript. Q: What is “responsible hope”? Responsible hope, for me, is a way to indicate that our hope, our language about it and our practices related to it need to remain accountable to the losses and limits of life, to the real vulnerabilities of life. It’s a kind of corrective against thinking of hope as more akin to optimism or the tendency that we have sometimes when people are in deep struggle to immediately reassure them that everything’s going to be OK. Thinking about hope responsibly is a way to encourage and foster a sense of possibility that doesn’t deny the ways in which things aren’t OK.
Q: You write about the difference between hope and optimism. Explore that a little bit for us. Optimism involves a denial of all of the limitations around things, the losses and the vulnerability of things. It’s the “can-do” attitude: “No matter what, this will be OK.” Hope is different from that. Hope is a sensibility where you maintain a sense of possibility but never lose sight of all of the obstacles and challenges. It’s a more sober disposition than optimism, and also it may be a little bit more of an athletic disposition. It takes a while to really maintain this kind of hope and keep it going and keep working on it. Q: In your book, you use two Picasso paintings as illustrations of the theme of your dissertation: the tension between hope and the realities of the world. Why did you choose those two particular paintings? The first one is called “The Charnel House,” and Picasso painted it as news of the concentration camps spread to France. It’s a pile of bodies and appendages, and in the pile you can identify three figures: a woman and a man and a baby. Contrast that painting to “Guernica,” which is a little more familiar. In “Guernica,” there is a witness who comes -- a face, a living face with a lantern, extends over the violence. In “Charnel House,” there’s no witness. It’s an even more sober painting. 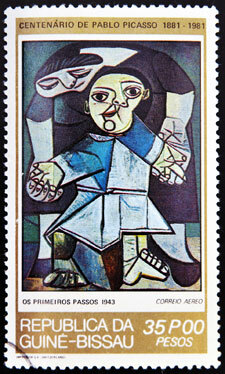 The other one he painted earlier, in 1943, and it’s called “First Steps.” It’s a cubist rendering of a mother supporting her child who’s learning to walk, and I just love it. They look awkward but sweet, and you can feel the shifting weight in those bodies. It connects with the experience of doing that with my own kids, and the excitement that that entails. I was working on my dissertation and went to see an exhibit of Picasso’s work during the war years at the Guggenheim in Manhattan. They had situated these two paintings close to one another. Once the dissertation was done, I ended up thinking about hope in a different way -- less a formal study of hope and more a reflection on practicing hope. I returned to those paintings and used them myself in spiritual practices and meditation. That exercise of moving back and forth between the two of them has remained for me a helpful kind of grounding exercise, but it’s also a way to communicate to groups what I mean by moving between these two images. Q: You have talked about the ways in which your understanding of hope differs from the tradition. What do you mean by that, and why is that significant? One difference is -- and this is really an argument advanced by liberationist theologians, who insisted that our object of hope, the kingdom of God, or the “kin-dom” of God, is not solely at the end of history or above creation but is intimately related to this creation of life that we know, and its unfolding here, and our job is to either usher it in or clear the space for it to emerge. So that’s one corrective against a more traditional understanding of the kingdom of God as completely otherworldly. The second [difference] is really a kind of presumptuous dispute with St. Thomas Aquinas. Aquinas made a distinction between the theological virtues and the moral virtues. He said that the theological virtues of faith, hope and love are infused in us by God and orient us toward God, while the moral virtues are things that we learn through practice and doing. In my own experience, hope has required a lot of practice. So I would like to merge the theological dimension and the moral dimension of hope. I find the idea that hope is something that we either have or don’t have, something that God infuses in us -- I find that hurtful. It’s harmful to people, for example, who struggle with depression or folks who are wrestling with despair and hopelessness. I’d like to be able to say something to them other than, “You must not be infused by God with hope.” Right? I think hope requires us to practice it, whether we’re feeling God’s presence on that day or not. Q: So hope is not something that we have but something that we practice? Yes. I think that hope is something that we practice, that we learn through doing repeatedly over time. [Some days] we feel it build up in us, and then other days we feel it dissipate, and we have to build it up again. I do think it’s important that it’s not something we alone are doing; it’s practices of attentiveness to these sources of hope in the world. It’s a trying to create in our lives and the rhythm of our days some openness to see God’s presence and movement in the world and be encouraged by that. Q: What are these practices? One of them is movement. It doesn’t have to be between Picasso paintings, but that kind of constant interaction between the heaviest, most sober headlines of the day and then the stories of what Sharon Welch calls “engaged goodness.” These stories of people who are in incredibly difficult contexts doing what they can, resisting violence, helping one another. It’s really allowing ourselves to see that these activities and the possibilities that they represent are not anomalies or exceptions but are indications of what we are capable of in our relationships with one another. Many of the practices I have in mind are practices of attentiveness: to look to the world, to see the world in a certain way and to try to tell those stories in a way that other people can hear them and feel encouraged by them. Q: What are the practices for folks who are dealing with the worst that the world can offer? When I was in graduate school, we had an assignment in the Hebrew Bible class to go talk to someone who had experienced suffering and ask them about their faith. I had worked in refugee resettlement and had remained friends with a family from [what is now] the Congo. [The father] was a minister who had preached a sermon denouncing [President] Mobutu Sese Seko and then had to flee the country. So I went back to see him and asked all these questions. I kept expecting that he would articulate rage and lament and grief. What he just kept giving back to me was consistent words of faith and of hope and trust that things were going to be OK, even when they were in their darkest. And gratitude for the people who had helped them escape, gratitude for the people in the refugee camps who provided water and gave him a space where he could continue his ministries, you know, all of these things. And so questions like yours always make me go back to him. For folks who are really in terrifically awful circumstances, the idea of contemplating whether or not they feel hopeful is a luxury, right? What they’re focused on is survival and getting to the next stage of safety. So I think that if they have space and time to reflect on this, it’s not in the moment when they’re trying to survive. But what he did articulate to me was this consistent sense of trust and faith and, yes, gratitude for the support that he did receive in those moments. I’ve lived a very comfortable life. My darkest days were connected to miscarriages that I had, and during those days, I was not thinking about practices of hope. I was just doing things to try to find out what was going on with my body and what the options were, and building relationships with people that I had come in contact with before. And I think, in retrospect -- I look back and I say, “Oh, those were practices of hope.” For me, studying, learning, talking, trying to understand what’s going on with my body, thinking through what the possibilities were -- those were the mechanisms for keeping alive some sense of possibility, but I didn’t have that language then, you know? Q: You’ve also talked about changing the object of hope as a way of dealing with misfortune. What’s the theological basis for that practice? So it is that process of discerning, not only God’s presence, but also God’s lure or calling in different directions. And being properly humble about clarifying when a goal is really our goal and when it is God’s calling. So that’s part of what the shift is. That’s incredibly difficult, because we want to believe that God’s calling and our own aspirations align really nicely, right? This work of re-evaluating that hope also can be a humbling endeavor. Q: How does this work on hope fit into your larger academic and theological project on peace and reconciliation? Right now my focus is really on conflict transformation. The school of conflict transformation insists that conflict itself is a natural element of life, and that within conflict there’s a potential catalyst for some positive change. For me, that’s exactly the conception of hope, right? That within this really difficult time there is some kind of possibility for constructive change, and that our job is to attend to that, identify it and then engage conflict in ways that are constructive in making that sort of turn. The broader connection is that I’ve been preoccupied in Christian ethics -- with the “how” of things. It’s not only what we do in terms of policy change or social justice work but that the way we do things really matters. That’s where this connection to virtue ethics comes in for me -- hope. I wrote a book called “Christians in the Public Square,” and that’s trying to argue that when Christians enter into these public and contentious spaces, we should do so with love toward those with whom we disagree, with attention to moral ambiguity as something that we have with us and need to figure out how to use constructively and with theological humility. So it’s still this preoccupation with the how of things, right? Not whether we hope but how we hope appropriately.